Take a journey through some of America's most beloved national treasures. 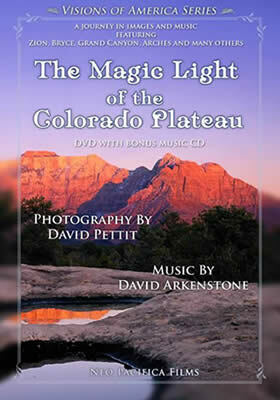 "The Magic Light of the Colorado Plateau" reveals hidden wonders, grand vistas, snow-covered mountains, and the grand splendor of the seasons in this magical land. 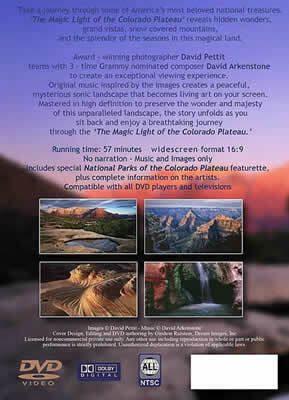 Award - winning photographer David Pettit teams with three-time Grammy nominated composer David Arkenstone to create an exceptional viewing experience. David Arkenstone has established himself as one of the best contemporary-instrumental musicians of our time. By combining the musical styles of classical, world, classic rock, and new age, he creates distinctive tracks that have yielded him 3 Grammy Award nominations, 24 solo recordings and millions of records sold.